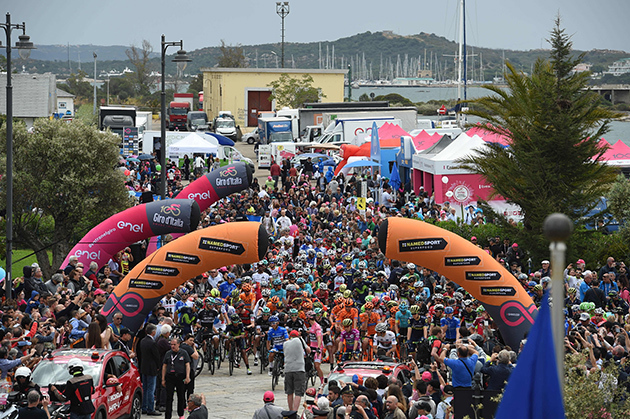 Weather at the finish town of Tortoli at 1:37 PM, local time: 24C (75F), Sunny with the wind from the south at 21 km/hr (13 mph). No rain is forecast. The race: All 195 riders who started stage one were on the line for the 11:43 AM start for stage two. And all 195 finished the stage as well. 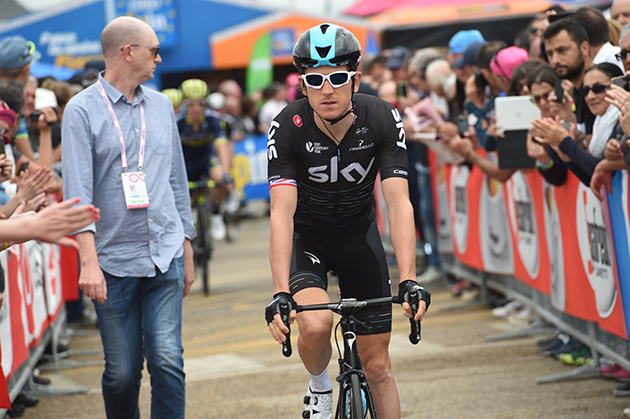 The surprises continued for day two at the Giro d'Italia. On a day expected to be too hard for the pure sprinters, a bunched ending played out and Jasper Stuyven, who had hoped for the projected reduced group finish, still capitalized with a fantastic third place. "I think I did a good sprint and I am happy with the result since it wasn't the best day for me with the headwind," said Stuyven. 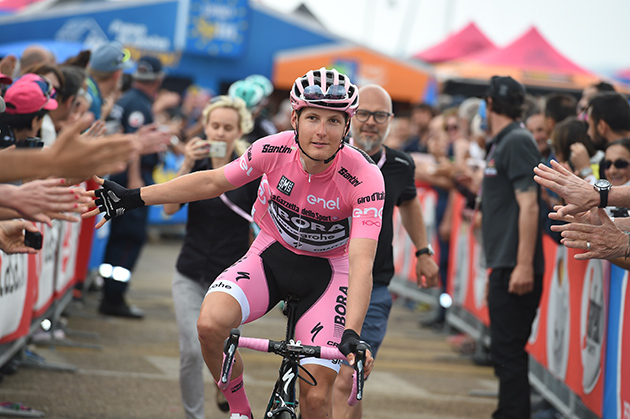 "I was hoping for a harder stage, so I was happy when Bahrain (Merida) started to pull really hard on the bumps after the cat-2 climb and made it really hard. So at least it was a little bit of suffering." 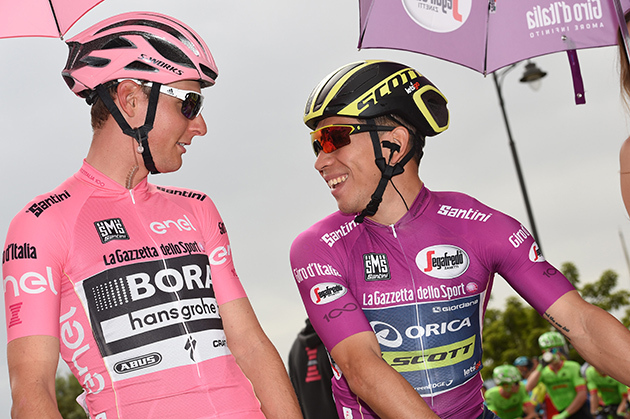 The battle for pink between the fastmen was supposed to happen in stage one, not stage two. 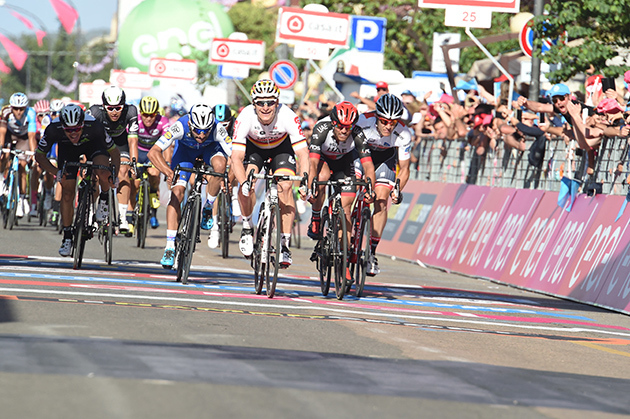 At 221 kilometers in length and jammed with relentless climbs, today's race was anticipated to be too hard for the pure sprinters, but thanks to a headwind that created a lackadaisical pace by the peloton, notably on the long category-two climb, it kept a large bunch intact for the finish. 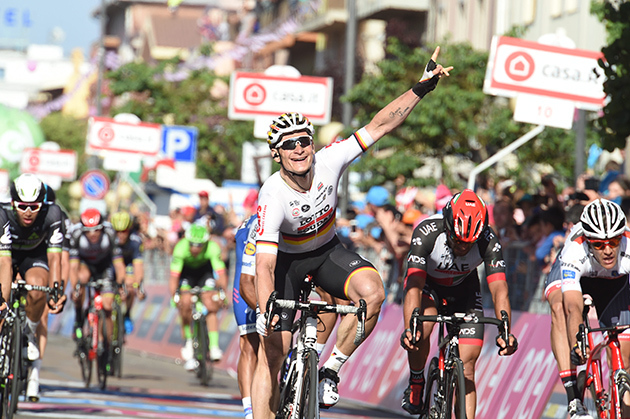 Andre Greipel (Lotto Soudal) won the maglia rosa honor, taking the victory after a late mishap by Caleb Ewan (Orica-Scott) cost him his chance. Stuyven, not rated amongst the world's fastest but still with a prowess when it comes to sprinting, timed his jump perfectly, overtaking a fading Fernando Gaviria (Quick-Step Floors) at the line for third place. "It was a good sprint, a tailwind," explained Stuyven. "I think I was too far back with one kilometer to go and I was lucky to grab a rider's wheel who was riding to the front. I like to get in the mix, and like I said I need harder stages so that sprinters like Greipel are dropped. If not, I just try and make the best of it, and sometimes it ends up in a nice podium." The pace in the last kilometers was too much for Giacomo Nizzolo, still not at his best form. 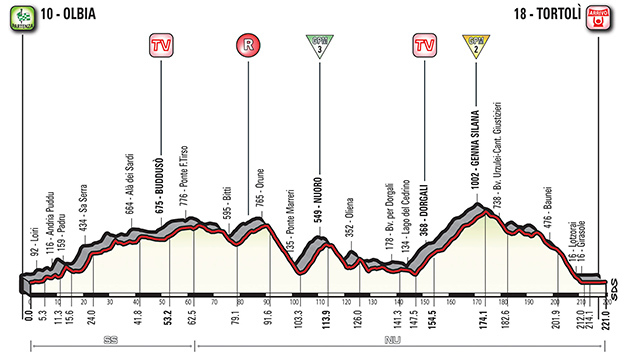 Typically one to easily handle the climbs of today, Nizzolo is still regaining his race form after a lengthy layoff to injury, and when Bahrain Merida upped the pace over the final hills, he had to let the peloton go. 11 MONTAGUTI Matteo AG2R LA MONDIALE s.t. 12 VILLELLA Davide CANNONDALE-DRAPAC s.t. 14 RICHEZE Maximiliano QUICK-STEP FLOORS s.t. 15 POSTLBERGER Lukas BORA-HANSGROHE s.t. 16 POZZOVIVO Domenico AG2R LA MONDIALE s.t. 17 MEZGEC Luka ORICA-SCOTT s.t. 18 EDMONDSON Alexander ORICA-SCOTT s.t. 19 YATES Adam ORICA-SCOTT s.t. 20 QUINTANA Nairo MOVISTAR s.t. 21 KOREN Kristijan CANNONDALE-DRAPAC s.t. 22 PONZI Simone CCC SPRANDI POLKOWICE s.t. 23 ROSA Diego SKY s.t. 24 VAN EMDEN Jos LOTTO NL-JUMBO s.t. 26 SIUTSOU Kanstantsin BAHRAIN-MERIDA s.t. 27 PIBERNIK Luka BAHRAIN-MERIDA s.t. 28 PUCCIO Salvatore SKY s.t. 29 ROSSKOPF Joseph BMC s.t. 30 LANDA MEANA Mikel SKY s.t. 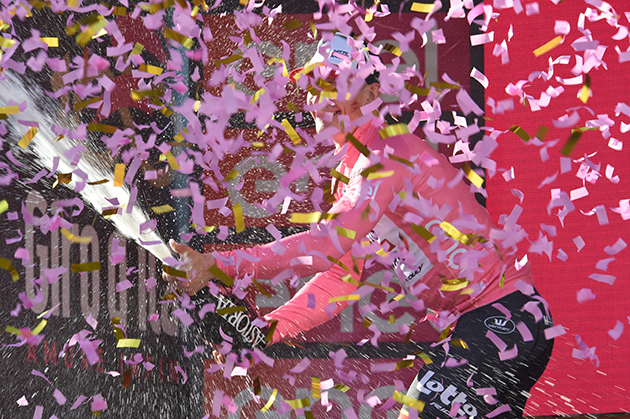 31 DUMOULIN Tom TEAM SUNWEB s.t. 32 MOLLEMA Bauke TREK-SEGAFREDO s.t. 33 ROJAS Jose MOVISTAR s.t. 34 SANCHEZ Luis León ASTANA s.t. 35 MARTINELLI Davide QUICK-STEP FLOORS s.t. 36 VAN GARDEREN Tejay BMC s.t. 37 MODOLO Sacha UAE TEAM EMIRATES s.t. 38 BONNET William FDJ s.t. 39 BIDARD François AG2R LA MONDIALE s.t. 40 KELDERMAN Wilco TEAM SUNWEB s.t. 41 PINOT Thibaut FDJ s.t. 42 MARCZYNSKI Tomasz LOTTO SOUDAL s.t. 43 PREIDLER Georg TEAM SUNWEB s.t. 44 KONRAD Patrick BORA-HANSGROHE s.t. 45 DEVENYNS Dries QUICK-STEP FLOORS s.t. 46 JUNGELS Bob QUICK-STEP FLOORS s.t. 47 AMADOR Andrey MOVISTAR s.t. 48 FORMOLO Davide CANNONDALE-DRAPAC s.t. 49 QUINZIATO Manuel BMC s.t. 50 TANKINK Bram LOTTO NL-JUMBO s.t. 51 GASPAROTTO Enrico BAHRAIN-MERIDA s.t. 53 MOLARD Rudy FDJ s.t. 54 GASTAUER Ben AG2R LA MONDIALE s.t. 55 DENNIS Rohan BMC s.t. 56 MONFORT Maxime LOTTO SOUDAL s.t. 57 CONTI Valerio UAE TEAM EMIRATES s.t. 58 CATALDO Dario ASTANA s.t. 59 MOHORIC Matej UAE TEAM EMIRATES s.t. 60 HIRT Jan CCC SPRANDI POLKOWICE s.t. 61 PETILLI Simone UAE TEAM EMIRATES s.t. 62 BAK YTTING Lars LOTTO SOUDAL s.t. 63 BERHANE Natnael DIMENSION DATA s.t. 64 HAGA Chad TEAM SUNWEB s.t. 65 BRUTT Pavel GAZPROM-RUSVELO s.t. 66 GESCHKE Simon TEAM SUNWEB s.t. 67 GOLAS Michal SKY s.t. 68 KANGERT Tanel ASTANA s.t. 69 ROLLAND Pierre CANNONDALE-DRAPAC s.t. 70 DE PLUS Laurens QUICK-STEP FLOORS s.t. 71 WOODS Michael CANNONDALE-DRAPAC s.t. 72 CHEVRIER Clement AG2R LA MONDIALE s.t. 73 JANSE VAN RENSBURG Jacques DIMENSION DATA s.t. 74 BERARD Julien AG2R LA MONDIALE s.t. 75 DE LA PARTE Victor MOVISTAR s.t. 76 VENTOSO Francisco BMC s.t. 77 MENDES José BORA-HANSGROHE s.t. 78 SLAGTER Tom-Jelte CANNONDALE-DRAPAC s.t. 79 RODRIGUEZ MARTIN Cristian WILIER TRIESTINA-SELLE ITALIA s.t. 80 GROSSCHARTNER Felix CCC SPRANDI POLKOWICE s.t. 81 MÜHLBERGER Gregor BORA-HANSGROHE s.t. 82 DUPONT Hubert AG2R LA MONDIALE s.t. 83 TEN DAM Laurens TEAM SUNWEB s.t. 84 AMEZQUETA MORENO Julen WILIER TRIESTINA-SELLE ITALIA s.t. 85 ALAFACI Eugenio TREK-SEGAFREDO s.t. 86 MORENO BAZAN Javier BAHRAIN-MERIDA s.t. 87 HANSEN Jesper ASTANA s.t. 88 LAGUTIN Sergey GAZPROM-RUSVELO s.t. 89 LUDVIGSSON Tobias FDJ s.t. 90 TCATEVICH Aleksei GAZPROM-RUSVELO s.t. 91 ZHUPA Eugert WILIER TRIESTINA-SELLE ITALIA s.t. 92 PATERSKI Maciej CCC SPRANDI POLKOWICE s.t. 93 CLEMENT Stef LOTTO NL-JUMBO s.t. 94 CAPECCHI Eros QUICK-STEP FLOORS s.t. 95 ANACONA Winner MOVISTAR s.t. 96 SCHLEGEL Michal CCC SPRANDI POLKOWICE s.t. 97 DE BUYST Jasper LOTTO SOUDAL s.t. 99 VAUGRENARD Benoit FDJ s.t. 100 POZZATO Filippo WILIER TRIESTINA-SELLE ITALIA s.t. 102 KISERLOVSKI Robert TEAM KATUSHA ALPECIN s.t. 103 VAN DEN BROECK Jurgen LOTTO NL-JUMBO s.t. 104 ANTON Igor DIMENSION DATA s.t. 105 HEPBURN Michael ORICA-SCOTT s.t. 108 HERMANS Ben BMC s.t. 109 HENAO GOMEZ Sebastian SKY s.t. 110 IZAGUIRRE Gorka MOVISTAR s.t. 111 ELISSONDE Kenny SKY s.t. 112 MORABITO Steve FDJ s.t. 113 HERRADA Jose MOVISTAR s.t. 114 VISCONTI Giovanni BAHRAIN-MERIDA s.t. 115 REICHENBACH Sébastien FDJ s.t. 116 DIDIER Laurent TREK-SEGAFREDO s.t. 117 JUUL JENSEN Christopher ORICA-SCOTT s.t. 118 POLANC Jan UAE TEAM EMIRATES s.t. 119 ALBANESE Vincenzo BARDIANI CSF s.t. 120 PLAZA Ruben ORICA-SCOTT s.t. 121 ROY Jérémy FDJ s.t. 122 STETINA Peter TREK-SEGAFREDO s.t. 123 DILLIER Silvan BMC s.t. 124 HANSEN Adam LOTTO SOUDAL s.t. 125 HOFLAND Moreno LOTTO SOUDAL s.t. 126 HAAS Nathan DIMENSION DATA s.t. 127 TIRALONGO Paolo ASTANA s.t. 128 HOWES Alex CANNONDALE-DRAPAC s.t. 129 MAESTRI Mirco BARDIANI CSF s.t. 130 KEISSE Iljo QUICK-STEP FLOORS s.t. 131 TRATNIK Jan CCC SPRANDI POLKOWICE s.t. 132 SELIG Rudiger BORA-HANSGROHE s.t. 136 BUSATO Matteo WILIER TRIESTINA-SELLE ITALIA s.t. 145 SUTHERLAND Rory MOVISTAR s.t. 146 KEIZER Martijn LOTTO NL-JUMBO s.t. 147 RAVASI Edward UAE TEAM EMIRATES s.t. 148 DE CLERCQ Bart LOTTO SOUDAL s.t. 149 SAMOILAU Branislau CCC SPRANDI POLKOWICE s.t. 150 CARTHY Hugh CANNONDALE-DRAPAC s.t. 151 MARTINEZ POVEDA Daniel WILIER TRIESTINA-SELLE ITALIA s.t. 152 BERNARD Julien TREK-SEGAFREDO s.t. 153 LUNKE Sindre Skjøstad TEAM SUNWEB s.t. 154 LADAGNOUS Matthieu FDJ s.t. 155 KOCHETKOV Pavel TEAM KATUSHA ALPECIN s.t. 156 FOLIFOROV Alexander GAZPROM-RUSVELO s.t. 157 JAUREGUI Quentin AG2R LA MONDIALE s.t. 158 FIRSANOV Sergey GAZPROM-RUSVELO s.t. 159 CICCONE Giulio BARDIANI CSF s.t. 160 ROTA Lorenzo BARDIANI CSF s.t. 161 HERNANDEZ Jesus TREK-SEGAFREDO s.t. 162 VERONA Carlos ORICA-SCOTT s.t. 163 ROVNY Ivan GAZPROM-RUSVELO s.t. 164 DE BIE Sean LOTTO SOUDAL s.t. 165 KOZONTCHUK Dmitriy GAZPROM-RUSVELO s.t. 166 KIRYIENKA Vasil SKY s.t. 167 DOMBROWSKI Joseph Lloyd CANNONDALE-DRAPAC s.t. 168 STAMSNIJDER Tom TEAM SUNWEB s.t. 169 SERRY Pieter QUICK-STEP FLOORS s.t. 170 CAMPENAERTS Victor LOTTO NL-JUMBO s.t. 171 FONZI Giuseppe WILIER TRIESTINA-SELLE ITALIA s.t. 172 LOSADA Alberto TEAM KATUSHA ALPECIN s.t. 176 BENEDETTI Cesare BORA-HANSGROHE s.t. 178 SAVITCKII Ivan GAZPROM-RUSVELO s.t. 179 BILBAO LOPEZ Pello ASTANA s.t. 184 BOEM Nicola BARDIANI CSF s.t. 187 BIALOBLOCKI Marcin CCC SPRANDI POLKOWICE s.t. 188 SENNI Manuel BMC s.t. 189 BIZHIGITOV Zhandos ASTANA s.t. 190 ANDREETTA Simone BARDIANI CSF s.t. 191 KOSHEVOY Ilia WILIER TRIESTINA-SELLE ITALIA s.t. 193 BENNETT Sam BORA-HANSGROHE s.t. 194 GENIEZ Alexandre AG2R LA MONDIALE s.t. 195 CASTELIJNS Twan LOTTO NL-JUMBO s.t. 12 FARIA DA COSTA Rui Alberto UAE TEAM EMIRATES s.t. 14 PONZI Simone CCC SPRANDI POLKOWICE s.t. 15 MODOLO Sacha UAE TEAM EMIRATES s.t. 17 YATES Adam ORICA-SCOTT s.t. 18 POZZOVIVO Domenico AG2R LA MONDIALE s.t. 19 ROSA Diego SKY s.t. 20 MONTAGUTI Matteo AG2R LA MONDIALE s.t. 21 ROJAS Jose MOVISTAR s.t. 22 SANCHEZ Luis León ASTANA s.t. 23 DUMOULIN Tom TEAM SUNWEB s.t. 24 JUNGELS Bob QUICK-STEP FLOORS s.t. 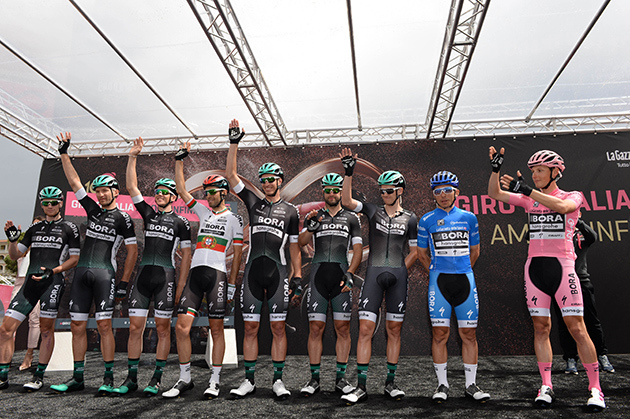 25 VILLELLA Davide CANNONDALE-DRAPAC s.t. 26 ROSSKOPF Joseph BMC s.t. 27 KOREN Kristijan CANNONDALE-DRAPAC s.t. 29 SIUTSOU Kanstantsin BAHRAIN-MERIDA s.t. 30 PIBERNIK Luka BAHRAIN-MERIDA s.t. 31 LANDA MEANA Mikel SKY s.t. 32 VAN GARDEREN Tejay BMC s.t. 33 PREIDLER Georg TEAM SUNWEB s.t. 34 KONRAD Patrick BORA-HANSGROHE s.t. 35 MOLLEMA Bauke TREK-SEGAFREDO s.t. 36 DENNIS Rohan BMC s.t. 37 MÜHLBERGER Gregor BORA-HANSGROHE s.t. 40 AMADOR Andrey MOVISTAR s.t. 41 FORMOLO Davide CANNONDALE-DRAPAC s.t. 42 MARTINELLI Davide QUICK-STEP FLOORS s.t. 43 PETILLI Simone UAE TEAM EMIRATES s.t. 44 VENTOSO Francisco BMC s.t. 46 MONFORT Maxime LOTTO SOUDAL s.t. 47 TCATEVICH Aleksei GAZPROM-RUSVELO s.t. 48 BARBIN Enrico BARDIANI CSF s.t. 49 BERHANE Natnael DIMENSION DATA s.t. 50 CONTI Valerio UAE TEAM EMIRATES s.t. 51 BAK YTTING Lars LOTTO SOUDAL s.t. 52 KANGERT Tanel ASTANA s.t. 53 CHEVRIER Clement AG2R LA MONDIALE s.t. 54 GROSSCHARTNER Felix CCC SPRANDI POLKOWICE s.t. 55 DE PLUS Laurens QUICK-STEP FLOORS s.t. 57 KRUIJSWIJK Steven LOTTO NL-JUMBO s.t. 58 KELDERMAN Wilco TEAM SUNWEB s.t. 59 MARCZYNSKI Tomasz LOTTO SOUDAL s.t. 60 GOLAS Michal SKY s.t. 61 WOODS Michael CANNONDALE-DRAPAC s.t. 62 MENDES José BORA-HANSGROHE s.t. 63 ANACONA Winner MOVISTAR s.t. 66 EDMONDSON Alexander ORICA-SCOTT s.t. 67 MOLARD Rudy FDJ s.t. 68 GASPAROTTO Enrico BAHRAIN-MERIDA s.t. 69 HAGA Chad TEAM SUNWEB s.t. 70 QUINZIATO Manuel BMC s.t. 71 PELLIZOTTI Franco BAHRAIN-MERIDA s.t. 72 CATALDO Dario ASTANA s.t. 73 TANKINK Bram LOTTO NL-JUMBO s.t. 74 ROLLAND Pierre CANNONDALE-DRAPAC s.t. 75 MOHORIC Matej UAE TEAM EMIRATES s.t. 76 HIRT Jan CCC SPRANDI POLKOWICE s.t. 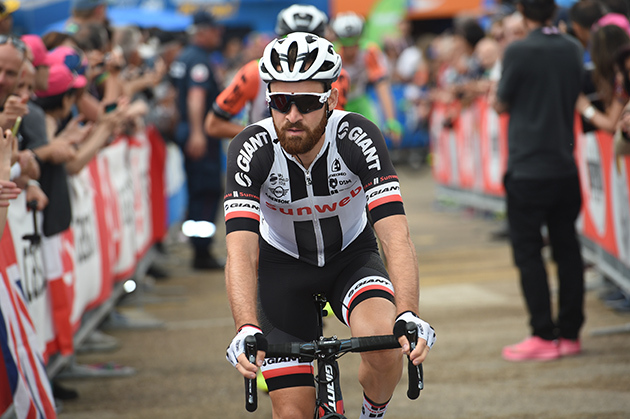 77 GESCHKE Simon TEAM SUNWEB s.t. 79 BERARD Julien AG2R LA MONDIALE s.t. 80 HANSEN Jesper ASTANA s.t. 81 LUDVIGSSON Tobias FDJ s.t. 83 DE BUYST Jasper LOTTO SOUDAL s.t. 84 SLAGTER Tom-Jelte CANNONDALE-DRAPAC s.t. 85 TEN DAM Laurens TEAM SUNWEB s.t. 86 PATERSKI Maciej CCC SPRANDI POLKOWICE s.t. 87 LAGUTIN Sergey GAZPROM-RUSVELO s.t. 88 SCHLEGEL Michal CCC SPRANDI POLKOWICE s.t. 90 ZAKARIN Ilnur TEAM KATUSHA ALPECIN s.t. 91 KISERLOVSKI Robert TEAM KATUSHA ALPECIN s.t. 93 SELIG Rudiger BORA-HANSGROHE s.t. 94 HAAS Nathan DIMENSION DATA s.t. 95 JUUL JENSEN Christopher ORICA-SCOTT s.t. 97 DUPONT Hubert AG2R LA MONDIALE s.t. 98 RODRIGUEZ MARTIN Cristian WILIER TRIESTINA-SELLE ITALIA s.t. 99 POZZATO Filippo WILIER TRIESTINA-SELLE ITALIA s.t. 101 HOFLAND Moreno LOTTO SOUDAL s.t. 102 HANSEN Adam LOTTO SOUDAL s.t. 104 HENAO GOMEZ Sebastian SKY s.t. 105 MORABITO Steve FDJ s.t. 106 ROY Jérémy FDJ s.t. 107 KEISSE Iljo QUICK-STEP FLOORS s.t. 109 STETINA Peter TREK-SEGAFREDO s.t. 111 DE LA PARTE Victor MOVISTAR s.t. 112 AMEZQUETA MORENO Julen WILIER TRIESTINA-SELLE ITALIA s.t. 113 MORENO BAZAN Javier BAHRAIN-MERIDA s.t. 114 CLEMENT Stef LOTTO NL-JUMBO s.t. 115 VAUGRENARD Benoit FDJ s.t. 119 FRAILE Omar DIMENSION DATA s.t. 121 ANTON Igor DIMENSION DATA s.t. 122 VAN DEN BROECK Jurgen LOTTO NL-JUMBO s.t. 124 HERMANS Ben BMC s.t. 125 REICHENBACH Sébastien FDJ s.t. 126 MAESTRI Mirco BARDIANI CSF s.t. 127 HERRADA Jose MOVISTAR s.t. 128 PLAZA Ruben ORICA-SCOTT s.t. 129 IZAGUIRRE Gorka MOVISTAR s.t. 130 TIRALONGO Paolo ASTANA s.t. 131 ALBANESE Vincenzo BARDIANI CSF s.t. 132 TRATNIK Jan CCC SPRANDI POLKOWICE s.t. 138 MARCATO Marco UAE TEAM EMIRATES s.t. 143 LADAGNOUS Matthieu FDJ s.t. 144 KOCHETKOV Pavel TEAM KATUSHA ALPECIN s.t. 145 ROVNY Ivan GAZPROM-RUSVELO s.t. 147 FIRSANOV Sergey GAZPROM-RUSVELO s.t. 151 BERNARD Julien TREK-SEGAFREDO s.t. 152 CICCONE Giulio BARDIANI CSF s.t. 153 MARTINEZ POVEDA Daniel WILIER TRIESTINA-SELLE ITALIA s.t. 154 CARTHY Hugh CANNONDALE-DRAPAC s.t. 155 SAMOILAU Branislau CCC SPRANDI POLKOWICE s.t. 156 ROTA Lorenzo BARDIANI CSF s.t. 157 SUTHERLAND Rory MOVISTAR s.t. 158 KEIZER Martijn LOTTO NL-JUMBO s.t. 159 KOZONTCHUK Dmitriy GAZPROM-RUSVELO s.t. 160 VERONA Carlos ORICA-SCOTT s.t. 161 FONZI Giuseppe WILIER TRIESTINA-SELLE ITALIA s.t. 162 LUNKE Sindre Skjøstad TEAM SUNWEB s.t. 163 DOMBROWSKI Joseph Lloyd CANNONDALE-DRAPAC s.t. 164 HERNANDEZ Jesus TREK-SEGAFREDO s.t. 165 KIRYIENKA Vasil SKY s.t. 166 DE BIE Sean LOTTO SOUDAL s.t. 167 STAMSNIJDER Tom TEAM SUNWEB s.t. 168 LOSADA Alberto TEAM KATUSHA ALPECIN s.t. 187 BIZHIGITOV Zhandos ASTANA s.t. 189 BARTA Jan BORA-HANSGROHE s.t. Simon Geschke heads to the start line. And gets to salute the crowd. 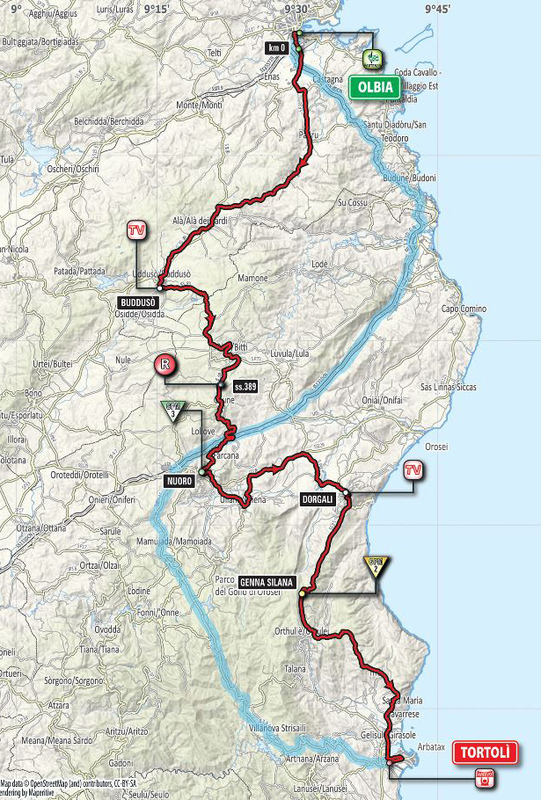 Organizer's preview: A hilly stage that could finish with a field sprint. The first part winds its way in Nuoro’s backcountry with undulations and three long climbs, including the categorised summit of Nuoro and the Passo di Genna Silana. The final 50 kilometers are mostly downhill or flat, but on a winding road leading into the finish, ideal for a field sprint.